Despite a complex new swordplay system, the new Zelda feels a lot like the last few. Flailing doesn’t work. It’s my first fight in The Legend of Zelda: Skyward Sword and simply swinging the Wii Motion Plus-enabled remote isn’t helping me attain my goal of brutally dispatching this man-pig barbarian. When I slash down he lifts up his meat cleaver and deflects my sword. When I swipe from right to left he quickly adjusts his weapon and blocks that too. I slow down to watch his motions more closely, always locked in on his position in the standard Zelda fashion. My sword twists slightly in my character’s hand, closely mimicking the motion of my wrist. The pig, confused by my inaction, cycles through his catalogue of defensive postures, hoisting his blade horizontally, then pointed straight up on his right. When he shifts the blade to his left I quickly slash from the opposite direction, hacking deep into his side. Two more blows and his remains turn black and disappear, leaving only a fluttering red heart behind. Swordplay is the heart of Skyward Sword. In a game that otherwise feels very similar to every Zelda since 1998’s Ocarina of Time, the central combat has been retooled in a way that significantly changes both the game’s pacing and how I play it. Combat isn’t just slower and more methodical, but also deadlier. It’s no longer enough to know when to block or dodge; now I have to stare intently at my enemies while avoiding their attacks until their weak spots are exposed. This makes Skyward Sword the first Zelda to do anything all that new or interesting with the formula since 2003’s Wind Waker. There are also other minor changes lifted from the role-playing game playbook, such as upgradable shields and potion crafting, but it’s possible to make it through Skyward Sword without ever fully exploring those features. These changes are welcome, as Skyward Sword does little to update the formula in most other ways. The details might be different — this Link’s town rests in the sky instead of the forest or ocean, a bird replacing the horse and boat of previous games — but the structure barely changes. At the start I meet Link’s hometown friends, including his school mates and the odd adults who apparently all work at the same market, all of them amusingly cartoonish in their own exaggerated way. After proving myself at a minor task a town elder suspects I just might be the fabled hero of legend. Shortly thereafter I have a sword, a string of dead bats weighing down my conscience, and an urgent new mission to rescue my girl Zelda from a series of increasingly dangerous dungeons with different environmental themes. In a call-back to the original Zelda the outlying areas I traverse to reach those dungeons can be as lengthy and puzzling as the dungeons themselves. So, yes, Skyward Sword is a Zelda game. No surprises there. And although that means I regularly flashed back to the Zeldas of old during the dozens of hours of play, it doesn’t mean Skyward Sword is poorly designed or disappointing. The new dungeons are among the best in the 3D Zelda canon, beautifully structured cathedrals of kid-appropriate evil replete with vexing foes and puzzles that largely hit the sweet spot between obvious and obscure. There’s little of the annoying repetition of the recent DS Zelda games or the frustration of Ocarina’s Water Temple. Enemies are now puzzling in their own right, thanks to that complex new combat system. Gadgets aren’t just nostalgic call-backs to the past but vital components that blend seamlessly into the action. 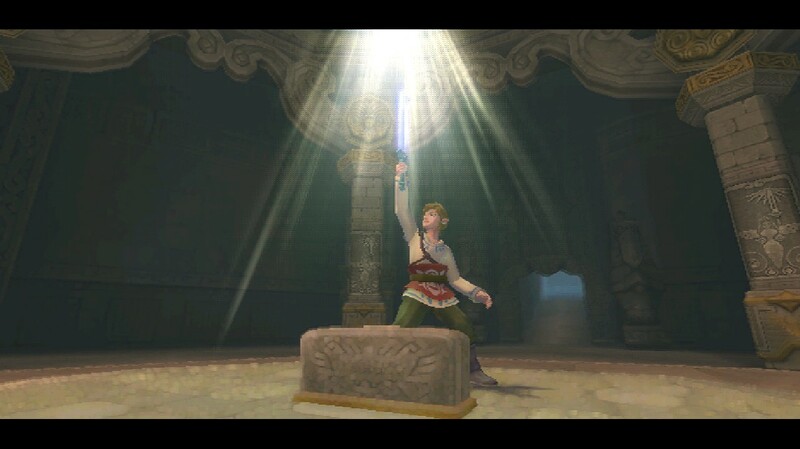 If an item as constant and iconic to the franchise as the boomerang can be discarded and not missed, as happens with Skyward Sword, then clearly the designers were more concerned with making a game that smartly uses the abilities of the Wii Motion Plus than with ticking off whatever fan-service features we expect from a Zelda game. And aesthetically, the orchestral score and painterly visuals make Skyward Sword almost as beautiful as Wind Waker. As good as it is, Skyward Sword reinforces what’s been evident since 2006’s Twilight Princess: Zelda’s main villain isn’t Ganon but its own legacy. Fearful of alienating fans with change, the series has stagnated over the last thirteen years, in the process dismaying others who are tired of the repetition. There’s something to be said for comfort and familiarity, and tweaks like Skyward Sword’s excellent swordplay and Wind Waker’s gorgeous art style prove Zelda isn’t entirely hidebound. Skyward Sword even seems to internally address these complaints, but only after many hours of play. I’m not yearning for a drastic tonal or structural overhaul, and I’ll happily play through whatever Zelda games Nintendo makes as long as they’re as well-crafted as Skyward Sword and Wind Waker. After thirteen years, though, it might be time to strike out from the Ocarina template and let Link forge a new path. Paste Games Editor Garrett Martin lives in Atlanta. He also writes about games for the Boston Herald and the Sarasota Herald-Tribune and has contributed to G4TV.com, Edge Magazine, GamePro, Joystiq, and many others. You can contact him on Twitter at @grmartin or at Garrett [at] Pastemagazine [dot] com.